American wild card Jack Sock falls in the first round to Tommy Robredo. 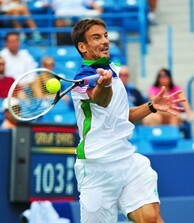 Tommy Robredo records another win in Cincinnati to advance to the second round. 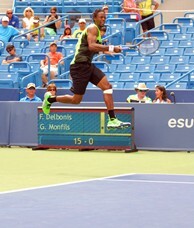 Gael Monfils hits a leaping forehand during his first round match. 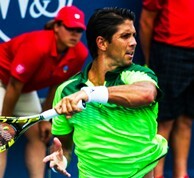 In an All-Spanish first round matchup, Fernando Verdasco defeated Marcel Granollers. 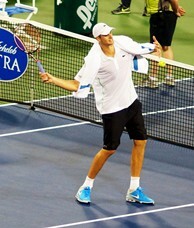 John Isner hits tennis balls in to the crowd following his first round win. John Isner, the 2013 Finalist, defeated Kevin Anderson 6-3, 6-4 in the first round of play at the 2014 Western & Southern Open. In their tenth meeting, the University of Georgia alum served up 15 aces and broke the University of Illinois grad twice en route to the 65 minute win. Isner is through to the second round in Cincinnati for the fifth time. He will face qualifier Marinko Matosevic, who ousted Nicholas Mahut in straight sets. Former quarterfinalist Gael Monfils pulled out a tough 6-3, 3-6, 6-3 win over Federico Delbonis in the first round of play at the 2014 Western & Southern Open. The athletic Frenchman, who made his seventh appearance in Cincinnati, kicked off the match with an early break and claimed the first set in just 25 minutes. Delbonis, who was bidding for his first hard-court win of the year, fought back to claim the second set and push the match to a third. Monfils got his second break of the match in the third set and claimed his 25th win of 2014. The Frenchman moves on and will await the winner of No.13 seed Roberto Bautista Agut and Martin Klizan. 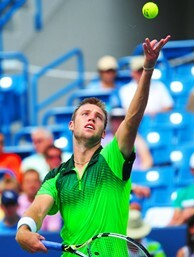 Sock, a 21-year-old from Nebraska, fought off two break points in the first set, pushing Robredo to a tiebreak. The American took a quick 5-2 lead in the tiebreak, but Robredo battled back to win five straight points to clinch the first set. The Spaniard got off to a quick 5-1 start in the second set, breaking Sock twice in the process. The big serving Sock rallied back to 3-5, but Robredo broke him once again to close out the match. Robredo is through to the second round in Cincinnati for the seventh time in his career and is set to face another American, Sam Querrey. Qualifier Benjamin Becker will continue on in Cincinnati, after defeating big serving Ivo Karlovic 7-6(5), 6-4. Karlovic, who leads the ATP in aces for 2014, served up 17 aces in the 80 minute match, but it wasn’t enough to conquer the former NCAA champ. Becker, who had lost to Karlovic in all six previous meetings, is through to the second round for only the third time in his career. He will meet No.3 seed Stan Wawrinka next. In an All-Spanish battle, Fernando Verdasco defeated Marcel Granollers 5-7, 6-3, 7-6(5).